KISSIMMEE, FLA. – SEPT. 6, 2017 – East Coast Defender (ECD) will ignite the demand for custom Land Rover Range Rover Classics (RRC) with its award-winning build expertise made famous by the company’s handcrafted Land Rover Defenders. Production of the first custom East Coast Defender RRC, “Project Alpha”, is underway and scheduled for completion in January 2018. All ECD Range Rover Classics will be hand built alongside the company’s Defenders at The Rover Dome in Kissimmee, Florida. 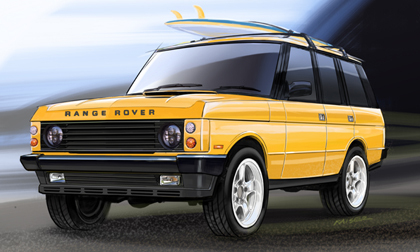 East Coast Defender will begin accepting orders immediately for custom 1970-1996 Range Rover Classics. East Coast Defender will serve as the pinnacle brand for custom, handcrafted RRCs. Using the same approach to hand build the RRCs as they do their award-winning Defenders, the build process begins with a client selecting the body style, drivetrain, wheels, tires, accessories, and exterior and interior colors of their custom RRC while working with ECD’s Lead Vehicle Designer. The ECD team then finds the foundation RRC vehicle and begins the build process by tearing it down to the bare chassis. Every project is then rebuilt, repainted, and reupholstered from the ground up and completely done in-house. Custom options will include two LS-based engines, including the LS3 V-8 (430 horsepower) or LC9 (330 horsepower) paired to either an automatic or manual GM transmission, as well as ten exterior and five interior color options, along with premium leather and stitch offerings. The dashboard and console will also be upgraded to include modern technology such as WiFi connectivity and wireless phone charging. Project Alpha will be built on a ‘95 long wheel base model that features the soft dash. This particular version was a favorite for many owners when it was first introduced. Production of the prototype vehicle began earlier this month and is scheduled for completion January 2018; it will be unveiled at East Coast Defender’s new West Coast Design studio in Malibu, California. ECD’s goal with each RRC custom build is to keep the heritage of the vehicle intact. Headquartered in Kissimmee, Florida, East Coast Defender (ECD) is an award-winning builder of premium Land Rover Defenders and Range Rover Classics. The company was founded in 2013 by three self-prescribed “British petrol heads,” brothers Tom and Elliot Humble, and Scott Wallace. Today, ECD is known for its commitment to perfection, dedication to build quality and ability to maintain the heritage of their vehicles while bringing them up to 21st Century luxury. ECD is home to 36 full-time employees in its 21,000 square-foot manufacturing facility in Florida, known as the Rover Dome, and its West Coast Design Studio in Malibu, California. Visit www.EastCoastDefender.com or call (407) 483-4825 for more information and to learn how to own a handcrafted, custom engineered Defender or RRC.